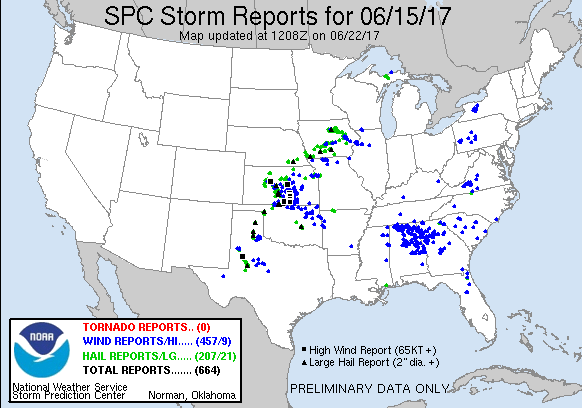 June 15th featured a surface low in western Kansas with a composite outflow and moisture gradient draped across the state that was forecast to drift northward throughout the day. With a dryline extended south into the Texas Panhandle, extreme buoyancy in the warm sector and south created a recipe for very large hail and strong downdrafts. A smaller tornado risk presented itself in Kansas along the composite boundary and near the surface low. Given that the following day looked like an Eastern Nebraska target, I decided to play the Kansas target rather than drive further down the dryline. SPC had an enhanced risk for the target area, primarily for wind which they upgraded to a moderate risk at the 1630z update. I left Grand Island around shortly after 14z and began the trek south into Kansas. 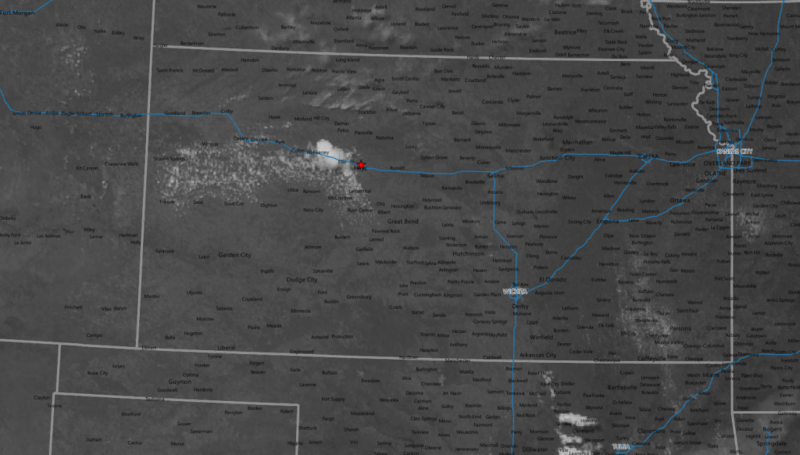 I rolled into Hays at about 17z and some very faint cumulus had started to form west-southwest of me. I decided to camp out in town and see what it would do. A mesoscale discussion came out shortly before 18z indicating a severe thunderstorm watch was incoming as the cumulus became more robust nearby. The first cell of the day was going up just west of my location. It’s initial motion appeared very slow so I decided to head on over. 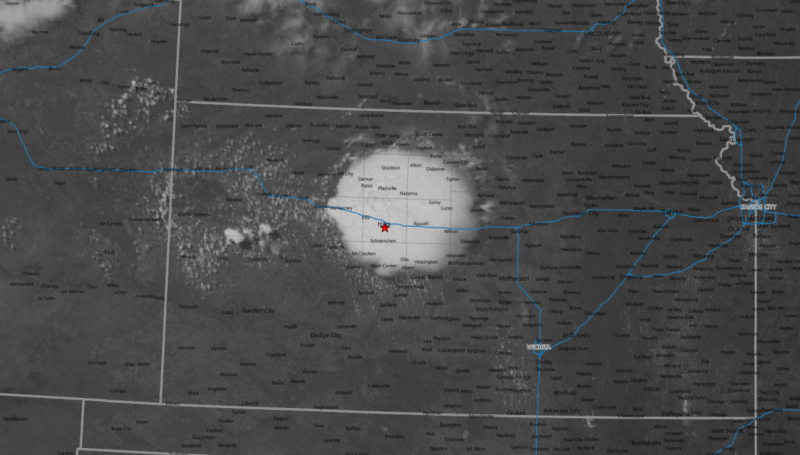 It soon exploded into a dominating supercell on satellite. Nothing too exciting to start with. A new cell started to go up east of the initial one and they danced with each other for a little bit as they drifted east. Just before 21z a tornado warning was issued for the primary cell which is when the photo above was taken. There was a small base in the distant but nothing really interesting as far as lowerings went. 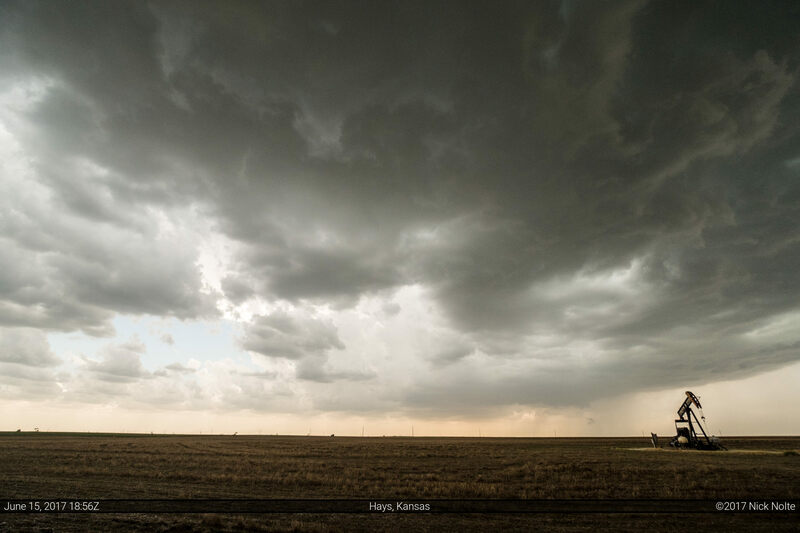 I tracked the storm south and east of Hays and while it made for an interesting sky, nothing tornadic was imminent. The storm continued on similar to this for another couple hours until storms started to popup all over the place and backbuild westward along the boundary. I tracked along with them until dusk before heading home.